Is the successful implementation of ITIL® processes enough to ensure effective and efficient IT operations? The answer is NO. ITIL® processes alone cannot guarantee the success of an IT Service Management program; IT Services have to be designed to be manageable in the first place. For example, the goal of the Incident Management discipline in ITIL® is to restore service quickly. This goal cannot be achieved just by putting in place good incident management processes. Good Error Handling and Logging by an IT Service is absolutely critical to the success of any incident management process. ITIL® V3 Service Design book provides much needed guidance on designing IT Services that are operable and supportable. 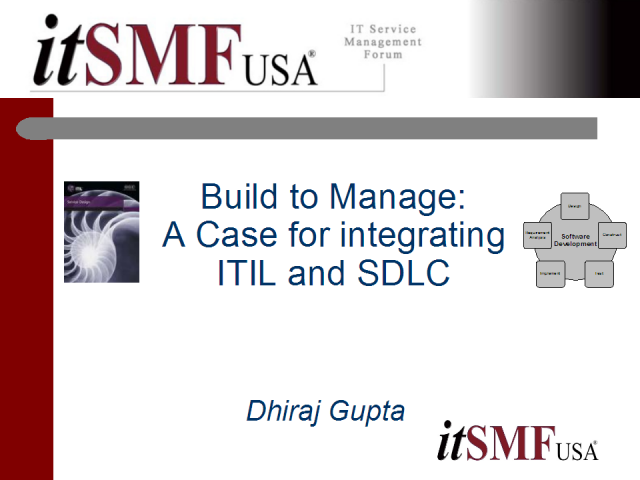 This presentation discusses several ITIL® derived Deliverables and Activities that, if addressed as part of the Software Development process, will ensure a seamless Service Transition as well as smooth Operation throughout the life of the Service.